Clear Vinyl Roll up curtains protect your screened porch, restaurant outdoor dining area, commercial outdoor areas and anywhere you need drop down curtains for protection from the weather while still maintaining your view. All are custom made and designed to fit any area using marine grade fabrics, marine clear vinyl and marine hardware. See options, fabric descriptions, measuring instructions and designs below. Scroll down for design forms below . Download our fillable forms and fill out with your measurements, then “save as” (newfilename) and emailed or faxed to us for ordering or a quote. Orders can be placed online, by email, by phone (800-933-6936) or faxed in @ 410-745-2920. For help with designs and measuring, email photos to sandyp@pycawnings.com. 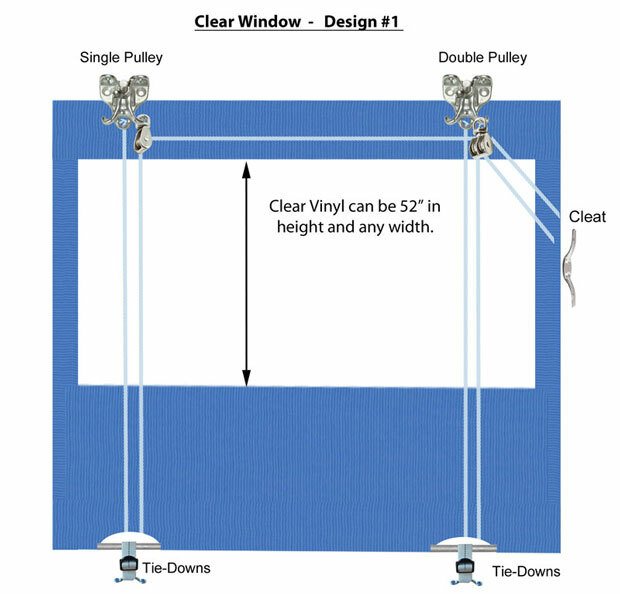 For price list, online ordering, and installation instructions Return to our Porch Protection Curtain Page. Weblon Coastline Plus from Herculite® is an awning fabric backed by years of tested performance. It features a strong PVC base material that stands up to shrinking and remains tight on the structure. The top surface is treated with a Rain Kleen® finish for color retention and a prolonged fabric life. Coastline Plus is UV, water, and mildew resistant. The fire-retardant fabric is also strong, waterproof, and when used as framing with marine clear vinyl makes a stronger longer lasting curtain that will hold up during heavy winds. This UV Treated clear marine vinyl is perfect for the outdoors. The Clear Vinyl is a 20 ga. thickness and double polished for optimal clarity. Extremely durable, flexible, waterproof and built for quality with a -20 below cold crack factor. GORE TENARA Sewing Thread will not be damaged by exposure to sunlight, weather or water during the lifetime of the fabric with which it is used. Lifetime warranty. No more seam splits. 1. Measure desired width of curtain. If using side fasteners- see instructions & options above. *Zippers available to zip panels together on request. Email Sandy for custom design help. 2. For Drop Measurement: Measure from where you will mount the top of the clamp to the bottom of the Porch Roller Curtain allowing 2” below curtain to mount tie-downs. All Porch Protection Curtains come with tie-downs. Side Tie Downs upon request to eliminate tripping hazards. *Top clamps on curtain can be either wall mounted or ceiling mounted. 3. Custom Drops available. For drops more than 10 ft., please contact us for pricing. 4. Snap on Door Panels – Allows you to open and close a door without rolling up a curtain. Choose design/layout and email to sandyp@pycawnings. If help is needed with measuring or a custom design, you can call, email and/or send photos. *Drawings and Hardware not to scale. Our Clear Curtains are custom made and designed to fit your needs.